Directions: In a pan on medium heat, melt coconut oil. Add diced onions and peppers (mushrooms too if you like those). Stir occasionally until onions are translucent and soft. 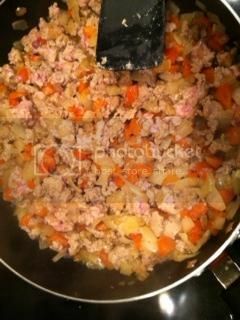 Add ground turkey breast and continue to sautee with vegetables. Add garlic and herbs to taste. I used a dash of cayenne pepper and sea salt, but you can choose to get creative with spices and seasonings! Cook until meat is golden brown, remove from heat and set aside. In a separate pot on high heat, bring water to a boil. Chop cauliflower into small florets and add to pot. Boil until florets are soft. Once cooked through, remove from heat and drain excess water. Mix cauliflower, butter, coconut oil and seasonings in a blender. (You can choose to use 2 TBSP of either butter or coconut oil if you prefer, as opposed to 1 TBSP of each). If you're looking for a good workout you can choose to forego the blender and mash by hand. Puree until creamy and smooth. You might find that you need a bit of milk/stock to help yield a creamier texture. If desired, add and continue to blend until you achieve the desired consistency. In review: Let me just tell you, I LOVE mashed potatoes. I could eat them all day every day I love them so much. However, since becoming a nutritionist and doing more than a little research on all things food related, I have eliminated my white potato consumption. I'm a first born. We're all-or-nothing kind of people. Fun Fact: According to a study conducted at Harvard, white potatoes are the #2 food that promote weight gain. Don't freak out! Everything in moderation. So, needless to say, I was super excited about these mock mashed potatoes. And I was not disappointed! Deeeelicious. 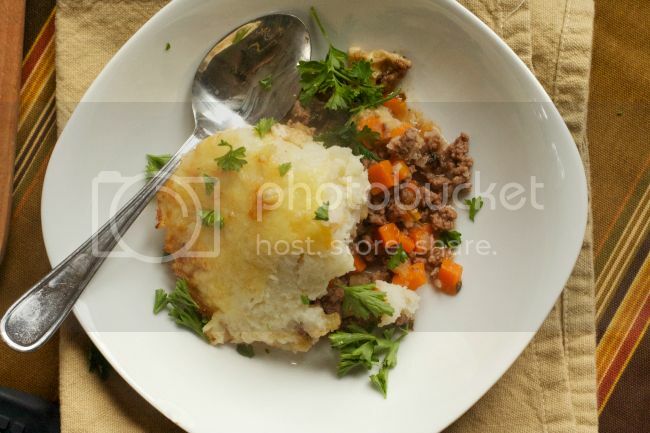 I served myself a big bowl of cauliflower mash with my caramelised ground turkey breast on top and wa-la, Shepherds pie done healthy! If you're looking for something a little more structured, perhaps to serve at a family dinner, check out this Shepherds Pie recipe from Oven Love. Let me know what you think! I can't imagine a more heart-warming, comforting meal to enjoy during these cold, winter days. Older PostSNOW DAY: Protein Peanut Butter Cocoa!